Doudou Diene, a “UN expert” on racism, recently told the UN Human Rights Council in Geneva that “Islamophobia today is the most serious form of religious defamation”, but he failed to define “religious defamation”, or to say why it was a serious thing. freedom of expression cannot be used as a pretext or excuse for incitement to racial or religious hatred. Listen, Doudou: a cartoon of Mohammed with a dog’s body does not incite hatred towards Muslims, it incites Muslim hate. And just like everyone else, Muslims are responsible for their own hatred. 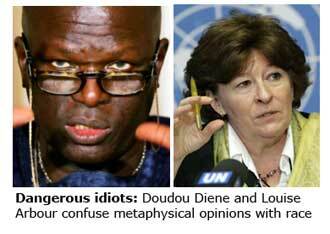 The UN High Commissioner for Human Rights, Louise Arbour, is similarly clueless. On the subject of Doudou’s report, she said “I have no reason not to share his concerns”. Fortunately there is the International Humanist and Ethical Union to counterbalance the ravings of these two. Roy Brown, the IHEU’s representative, said Arbour was “just plain wrong”. The little regrettable hostility that does exist among indigenous Europeans has not arisen in a vacuum, but as a reaction to Islamic extremism — demonization of Jews, infidels and homosexuals and contempt for Western culture. The EU finds it problematic to reconcile the notion of defamation with the concept of discrimination. In our view these two are of a different nature. He went on to state that religions do not deserve special protection under international human rights law. First, he fails to distinguish between, on the one hand, Islamophobia, which he defines as “baseless hostility and fear vis-à-vis Islam”, and on the other hand, genuine concerns regarding the rise of Islamic extremism. Secondly, he fails to recognise that there are important differences between the Islamic and other worldviews that contribute significantly to the problem. Rather than dismissing Europe’s defence of its identity which he describes as ‘based on intangible “values”’ (which he puts in scare quotes) he should recognise that these values are neither intangible nor exclusively “European”, but universal. They include, inter alia, the dignity and autonomy of the individual, equality of the sexes, democracy, and human rights – surely the very rights that this Council should be seeking to defend. That these differences do exist and are far from intangible is evidenced, for example, by the OIC’s promotion of the Cairo Declaration of Human Rights in Islam as an alternative to the Universal Declaration of Human Rights. Hmm, how do you “defame” religion? And what is a UN expert? “Defamation” is usually understood as a legal concept, with tests as to diminished standing in the community and that sort of thing, with usually an attendant damage to one’s reputation and ability to earn a living as effectively. I read this report in an AP story earlier this morning, and the journos just don’t define what an expert is? Expert in what? How are you an expert in racism? Does he teach aspects of it? Has he studied it through the ages and written doctoral theses on it?. Sloppy journalism. Much as I applaud IHEU’s counterbalancing, I fear the word counterbalance here is optimistic. The religionists are the ones who’ll get the ear of the politicians, while the likes of IHEU will be rubbished. 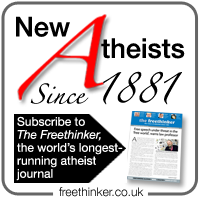 Militant atheists, blah-di-blah, don’t you know? In reply to Andy A, a “UN expert” also known as a “Special Rapporteur” (best translated as “Special Investigator”) is someone with high academic credentials appointed by the Human Rights Council to investigate a specific area of human rights concern. He (or she – one of the best is Asma Jahangir, Special Rapporteur on Freedom of Religion or Belief) is supposedly independent of his government, impartial in his judgement and free of all external influence. Sadly Doudou Diene has tended in his reports to display a bias in favour of Islam and fails to distinguish between “Islamophobia” and rational concerns regarding the rise of Islamic extremism. He also fails to distinguish between opposition to Islamic ideas and hatred of Muslims.